It’s been a while since I’ve done a review, but I’ve been swamped with work. It takes time to put these things together; time I have not had of late. 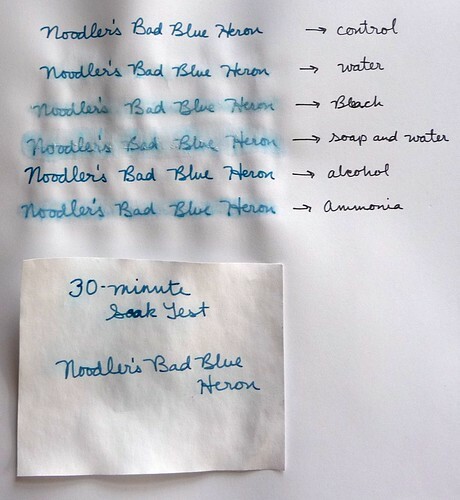 HOWEVER, since I was able to get my hands on a bottle of Noodler’s Bad Blue Heron, I thought I might as well put a review up. I bought this ink because a. someone on FPN described it as looking like the Crayola Cerulean crayon and that was always my favorite color in the box b. this is a darker bulletproof ink and I’ve been looking for one of those. I have not been disappointed. Firstly the color. This ink does look a bit like Cerulean crayons when it is wet, but it dries to a very attractive dark blue with hints of green and maybe turquoise. It might even be described as a blue-black. It’s difficult to capture the color of this ink in pictures, but I’ve done my best. It has that trademark chemical odor that can down right knock you over if you sniff the bottle. It sticks to the nib and can be a pain to clean off. Now about this sticking business. This was a bit off putting at first. When I first got the bottle I dip tested it with a dip pen. This ink dried on the dip pen nib and it was really hard to wipe off. This made me nervous. So, I put it in a Sheaffer’s Cartridge pen. I did not have the same sticking problem. After having it in that pen for a few days I switched it over to my Levenger Plumpster. I didn’t have any problems rinsing the Sheaffer clean, and I can’t find any evidence of ink still stuck on the nib. It’s been in the Plumpster for several days now and I haven’t had any problems at all. No clogging, no nothing. It also is not sticking to or staining the walls of the cartridge I put it in. So, I’m confident that this ink is perfectly pen safe. My one suggestion would be to fill the pen using a syringe or some other method so you don’t have to dip the nib in the ink. This makes for easier clean up. But either way you should be fine. I also recommend that you flush you pen every one to two fills of this ink. Good pen hygiene=happy pens! Further Note: When I write a review of an ink I strive to provide the most accurate account of my experiences as possible. My comments about the ink sticking to the dip pen nib should not be misconstrued as a denunciation of this ink. I, in fact, love it and it will likely see heavy rotation in my pens. For some reason, that is beyond my understanding, people tend to have a visceral kind of reaction to Noodler’s ink as if it is the devil or something. I am not one of those who subscribes to that sort of nonsense. 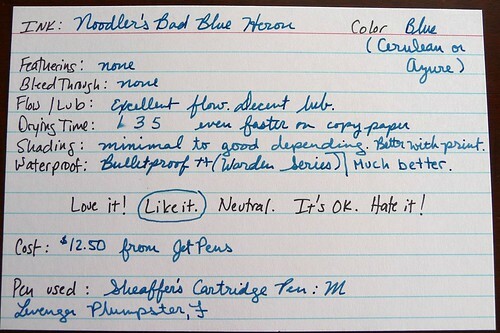 I have several bottles of Noodler’s ink, including two other bulletproof inks, and I use them without reservation! Here are a set of swabs meant to test this ink’s bulletproofness. This test was performed on 24# copy paper. As you can see A little of the blue dye is lifted when it come in contact with liquid; otherwise, this ink isn’t going anywhere. I got a little carried away with the soapy water test and actually did remove some of the paper. The ink is still there! Love your index card system! I really like your reviews, too! The reviews at http://www.jetpens.com/product_info.php/products_id/5078 (“if you ever let the ink dry out in your pen, that pen is no longer usable…no washing out Warden Series!”) still scare me a little, but your review has convinced me to be brave and give the stuff a try. This has become my main blue ink. I find that it seems a bit more faded or washed out looking when I use my Lamy Safari vs the Noodler’s standard flex. I also use it in my old Schaeffer for regular writing. I like being able to write out checks with this ink as well. Great review.